I started running competitively at the age of 12 when my soccer coach told me that I was better off without a ball at my feet! When I started racing track that year I had some success at the half mile and 1500m distances, but I wasn’t winning very many races. However, distance running was something that I started to enjoy because I felt that hard work in training could make up for any lack in talent or natural ability. Over the years I slowly moved up in distance from racing 5km to 10km cross country and track to eventually running my first marathon while I was a junior at Cornell University. In 2007 I was the youngest athlete to qualify for the US Olympic Trials Marathon at the age of 21. In 2012 I started racing ultra-trail-mountain running races. I was the US Mountain Running Champion that year (American record performance at Mt. 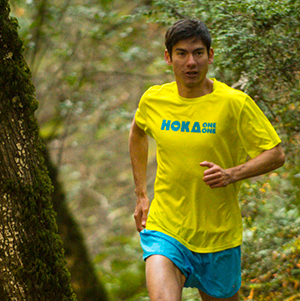 Washington) and debuted at 50km, 50-mile, and 100km trail races. I moved to Boulder, Colorado because I wanted to train at altitude in the mountains and have access to tons of trails. For the past year I’ve had the good fortune of getting to travel the world to compete as a runner. My travels in 2013 took me from New Zealand to La Palma and Switzerland and all across the US. It’s been a dream of mine to compete at the highest level in the sport and I look forward to training to become one of the best in the world. As I’ve learned more about ultra running I’ve realized how important race-day nutrition and fuel is for peak performance. I’m very thankful for the support of Vfuel as I trust in the quality of the gels to propel me to more course records and wins in the future. Favorite trail running memory: Watching the sun rise over the clouds and ocean that made the Canary Islands look like they were floating. This occured while running up the volcano that is the Transvulcania ultra marathon Sky Running race.